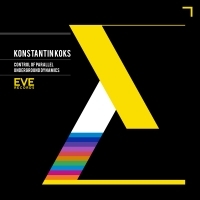 For our third release on the "new" EVE records we have turned to new Russian producer Konstantin Koks who made his debut earlier this year on Bashka Records to critical acclaim. This two track E.P. spans the gap between Minimal and Tech House with both tracks delivering on both depth and intensity with stylish arrangements and clever bursts of melody to keep things moving. 'Control of Parallel / Underground Dynamics' is available now from Beatport and iTunes.